The growing pains are clearly visible. Standup’s quirky inland offshoot is far from a safe or effective way to run anything on a river with consequence and mandatory moves (meaning the most technically rated, navigable Class IV-V stretches). But beyond that, the sport suffers from a serious lack of river-running style. Sure, the raging hormones of this restless teenager produce some eye-popping moments. But shots of paddlers armored in motocross garb to launch the local waterfall feel like artifice, a staged stunt. 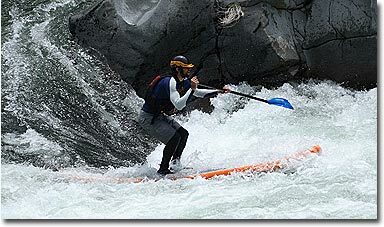 You’ll notice you rarely, if ever, see after-shots of paddlers sticking the drops or videos of them greasing the lines through rapids. The cutting edge of whitewater SUP feels like an episode of Jackass: a don’t-try-this-at-home, shopping-cart-off-the-skateboard ramp moment with a 50-50 shot at either a trip to the E.R., or YouTube glory. It’s easy to be a critic, until you actually try it. The only other people having near this much fun on this Class II-III stretch were in soaked jean shorts, enough High Lifes deep not to care about what happened to their thrashed inner tubes. Okay, so serious tubers (believe me, they exist) have run bigger, more complex drops in a much safer, cleaner (and cheaper) fashion certainly no flash in the hydraulic concept pan (Creature Craft, Hydro Bronc, bublik, river sledge, I’m talking to you). Being stuck in a sport’s adolescence however, means the equipment doesn’t always match the desired use. While effective on fast, glassy waves, SUPs struggle to run over shallow ledges, punch holes and peel into tiny eddies. 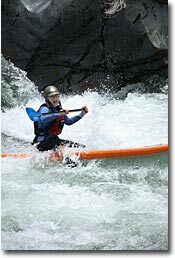 They will never eclipse kayaks as the most effective way to run steep creeks or technical big water. They do however, benefit from something the other concept rides don’t: a crossover from cool. SUPs’ roots lie in surf simplicity and an understandable entry-level, everyman appeal. It’s something Jeff Snyder’s ‘striding’ brainchild—charging technical rapids, standing on an inflatable kayak with a 10-foot kayak paddle—never had. The bottom line is getting over yourself and getting out to enjoy the river. Like the small day for surfers that makes a great day on the standup board, an SUP in the quiver means that low water no longer marks the end of the river season. The evolution is happening, and this hybrid sport is ready to hatch. Let the athletes push the design, however dumb it may look. This teenager’s complexion is already beginning to clear. Better board designs and ideas like retractable fins and safer leash systems are coming. New events, fledgling competitions and instruction schools are popping up in every corner of the country, and paddlers are claiming first SUP descents from the Upper Gauley to the Rogue River. Do it right though. There’s etiquette in surfing river waves the same as in the ocean lineup. But more importantly, an ideal downriver SUP that’s still in R&D means you swim, a lot. Rapids that demand respect have the upper hand. Obeying swiftwater protocol is a must. Nothing comes easy in whitewater SUP and it’s not going to look pretty. But I’ll take the anonymous online heckling. It’s worth it to make Class II-III fun again, precariously balanced, with a slightly bruised ego and likely bruised shins, laughing all the way to the takeout. —SUP Associate Editor Dave Shively is a Class V kayaker and a former raft guide who traded the Rockies for the Pacific Coast. He now enjoys shredding San Onofre peelers on his standup board.